Carlin Short competes in a cross country meet. Supporters say she is growing in the sport while living with autism spectrum disorder (ASD). Calin Short runs with teammate Eliza Davies. 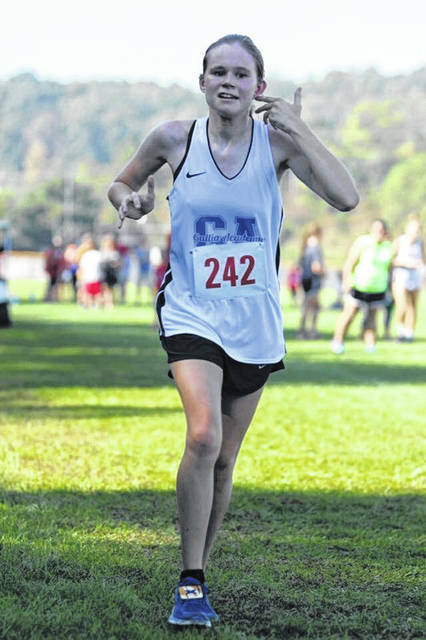 GALLIPOLIS — While running on a trail four years ago, Julie Short snapped a picture of her daughter, Carlin, running ahead of her and posted it to Facebook. She had no way of knowing that post would lead to Carlin competing in an organized high school sport for the next four years, something her parents, Scott and Julie, hadn’t thought possible. Throughout her life, Carlin, who is autistic with an intellectual disability, has been regularly integrated into mainstream settings and activities where possible and appropriate for her. “We’ve always tried to make sure Carlin is included and part of something,” said Julie about Carlin’s years in the public school system. Competing in sports, however, didn’t appear to be the right fit for Carlin. They had discussed race walking, because Carlin likes to walk fast, but in track and field, athletes compete and then must wait through the other events. That waiting period would have been difficult for Carlin. Instead, they started to discuss forming a race walking club that would give Carlin the experience in a setting more appropriate for her. “Little did we know, that wasn’t necessary. She was able to join a sport,” said Julie. That sport turned out to be cross country. It was Gallia Academy High School Coach Todd May who saw Julie’s photo and reached out to ask if Carlin may be interested in attending a few practices to see how she did. “Honestly, we didn’t know how this would go,” Scott said with a chuckle. Now, four years later, while Carlin may not be the fastest runner, she still manages to hold her own against other athletes. Sometimes even beating them. The only assistance she receives is guiding on the turns to ensure she stays on the course. “She does it all. She has the endurance. Not the speed but the endurance. And she’s determined to finish it,” Julie said. Introducing Carlin to cross country hasn’t been without its challenges. She sometimes doesn’t start running immediately with the other runners. That doesn’t mean she will come in last at the end, though. At the recent 48th Annual Patty Forgey Cross Country Invitational held at the University of Rio Grande on Saturday, Carlin finished 130 out of 146 runners with a time of 32:34:52. Teaching Carlin to pass other runners was also an issue. As if she saw it as a social moment, Carlin would often slow down and keep pace with a runner she was getting ready to pass. They had to work with her to keep running. That’s where the other cross country runners come into play and not just from Gallia Academy, either. Runners from other schools know Carlin now and encourage her on and off the course. Fans from other schools cheer for her, send pictures of her to the Shorts and praise her when she ran a good race. That supportive atmosphere isn’t just because of Carlin, though. It’s already prevalent in the cross country community and is what makes the sport perfect for her. Competing in the sport has had a noticeable positive impact on Carlin. While she is non-verbal, she still communicates through sound, gestures and body language. The Shorts see a change in that communication anytime she runs. “I think, it’s given her something that she knows she can do and do well,” said Julie. 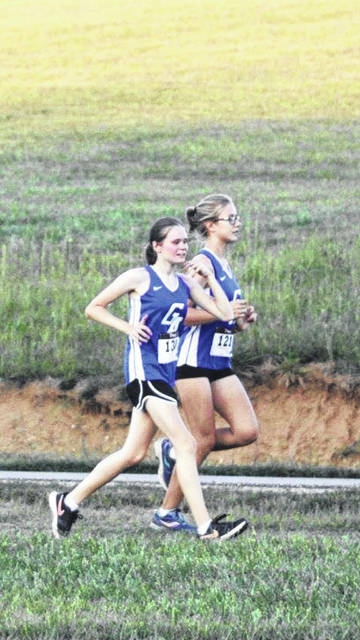 Both Coach May and Middle School Cross Country Coach Cheryl Greenlee have seen the impact first hand Carlin has had both on their teams and on the cross country community, as a whole. “She’s like a fixture now. Everybody expects her to be there and run. It’s a great fit because everybody cheers and we’ve never heard a boo there. It’s a perfect sport when it comes to the understanding and the friendliness, but they still have their solid rules of what they can and can’t do. It’s the closest sport where we can treat her as normal as possible. It’s a great experience,” said Coach May. The other teams are also protective of Carlin. May spoke of one rare incident when someone from another school made a comment that she was being assisted in running, and people from other schools rushed to Carlin’s defense. Because the middle school and high school teams often train together, Coach Greenlee has also seen the positive impact of Carlin’s presence on the other students. Not just with her high school peers either. At meets, it is often the middle school students who are stationed around the course to help guide her and they do so willingly. GAHS junior Eliza Davies can vouch for the positive effect Carlin has had on the individual members of the team, including herself. Prior to running with Carlin in cross country, Davies had little experience interacting with someone with a severe disability. As an eighth-grader she watched other teammates run with Carlin and now runs with Carlin herself. She’s also seen Carlin grow as an athlete over the years and commented on how she sometimes beats her running partners. While Carlin’s time on the high school cross country course will soon come to an end, the Shorts still possibly have several years of being a part of that community ahead of them. Their youngest daughter, Jalyn, a seventh grader at Gallia Academy Middle School, is now competing in the sport, as well. As far as Carlin, they hope to keep her involved in running after high school, either with 5ks, a potential running club in the community or even possibly a half marathon. “Running’s a lifelong sport. I think she could do it,” said Julie. Regardless of what Carlin’s running future holds, it’s clear from talking with the coaches, Carlin will have an everlasting effect on those who interacted with her the last four years, both on and off the course.